Digital Smile Design (DSD) is the newest tool with which you can participate, step by step, to create the desired smile along with the dental aesthetics specialist. DSD is a computerized process that simulates the outcome of the treatment, thus allowing results visualization of the procedures to be performed just before the first treatment session. The constant communication with the patient is very important to find exactly what are the needs and expectations regarding the desired aesthetic treatment. For this it is necessary that during the DSD consultation the patient to have a detailed and complete discussion with the specialist as well as to complete the form provided Smile Test. Making images that capture the early status of teeth and especially the physiognomy of the face and facial features are extremely important in order to achieve digital simulation. 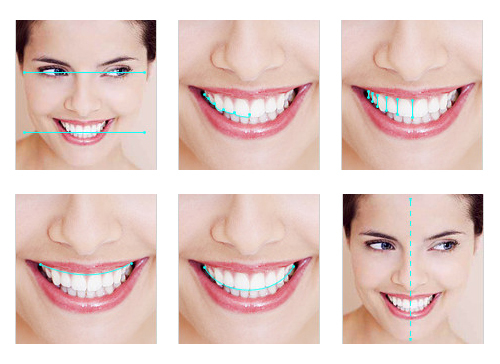 A perfect smile means a healthy and beautiful harmonization of teeth with the rest of the face features.2. Due to technology and information obtained, the specialist will present a new design of your smile using a digital program. Simulating multiple treatment possibilities helps you choose the best option. With DSD you can better understand your dental status, your treatment stages and, most importantly, you can see the outcome during the first visit to the doctor! DENT ESTET specialists in dental aesthetics have participated to certification courses held by Dr. Christian Coachman, the inventor of Digital Smile Design. Test DSD and see for yourself how your perfect smile looks like!